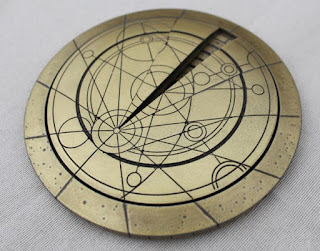 [Doctor Who] What is in the Doctor's Confession Dial? Steven Moffat is literally the cleverest man alive. However as evidenced by the internet he is also literally Satan. So what has our Satanic genius got in store for Doctor Who series 9? As shown in the season opener, The Magician's Apprentice/The Witch's Familiar, the Doctor fears his own death, and so has created a 'Confession Dial' which when opened will reveal his greatest secret. A big fuss is made of it in these episodes, as he sends it to Missy (his best friend) rather than Clara, and makes a show of rescuing it from Davros. More to the point - the Dial seems to be slowly opening! There are twelve segments, representing twelve episodes of the season (or perhaps twelve Doctors). What could be inside this dial though? As always, the answer is in plain sight.